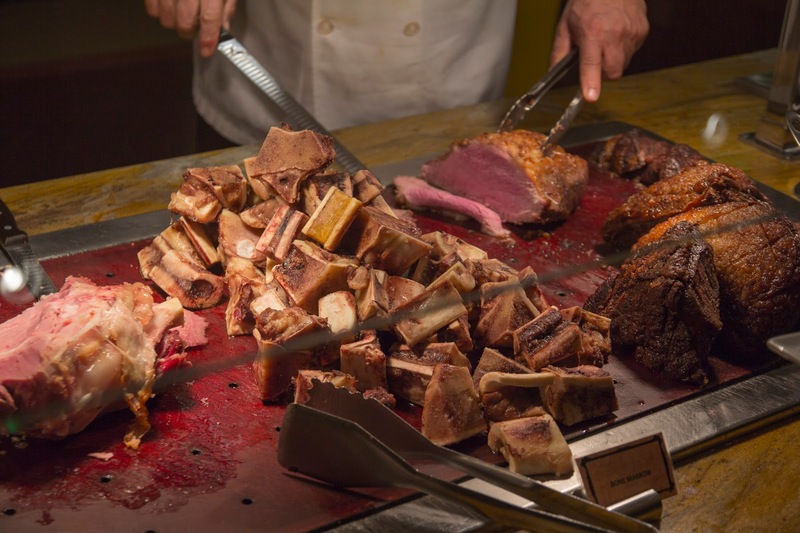 Buffets and Las Vegas go together like MSG and Dim Sum or alternatively, like Lindsay Lohan and a bad movie. However, we're not talking about those cheap buffets of yesteryear with large chaffing pans of slop representing all the colours of the rainbow. In the last 10 years, we've seen a shift to pricier, more elaborate spreads. 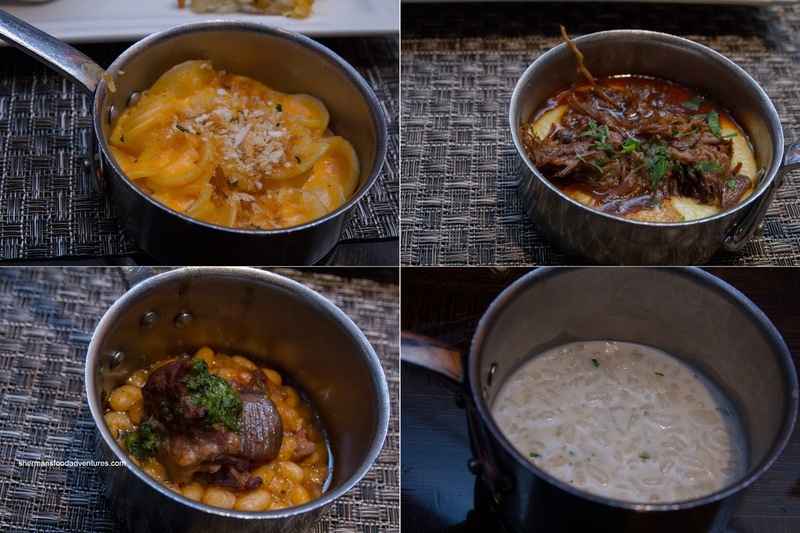 One of the newest is the Wicked Spoon in the Cosmopolitan which boasts smaller dishes emphasizing quality rather than quantity. Sadly, nobody in our party was really all that interested in any buffet action except for Vandelay, who joined me for lunch. 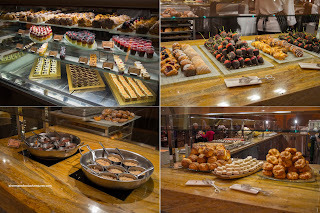 And in Las Vegas fashion, the buffet stretched the entire length of the restaurant with a wide range of eats. 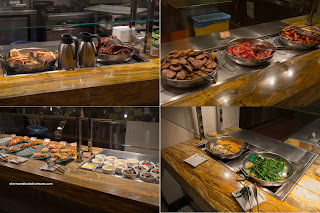 For $23.00 (on a weekday), we thought the buffet was well-priced as it also included either a Mimosa or Bloody Mary. Our plan of attack was to scope out the food (and take pictures of it) first before we loaded up on the wrong items. Hence, we totally skipped the Mexican and most of the Asian food sections (trust me, you won't miss anything). These 2 cuisines are never done right at buffets in my opinion. 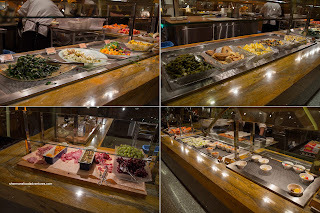 On the left side of the buffet was the Salad & Appies section which included a selection of salads such as kale, potato and beet. Around the corner, we found a selection of Charcuterie and condiments. Making the complete route around the buffet section, there was a small selection of specialty salads and Smoked Salmon. Directly across from it, we found the Mexican Food section where one could build their own taco. Right beside it was an Omelette Bar, which I decided not to bother with (it's too filling!). Onto my favourite section was the Carving Station which consisted of a Whole Sausage Link, Pork Belly, Roast Chicken, Ham, Roasted Bone Marrow and Roast Beef. I particularly liked the bone marrow as it was fatty and delicious. The beef was cooked a beautiful medium-rare while the pork belly was not as moist as we would've liked. Moving along, we had some Breakfast items including Pancakes, French Toast, Sausage Patties and Bacon. I didn't have of these as well, but they did look well-prepared, especially the meats. Right next to the obligatory Pizza Station was a some small plates (more on that later). And then we hit the section that was a hit and miss (but mostly miss) - the Asian Section. 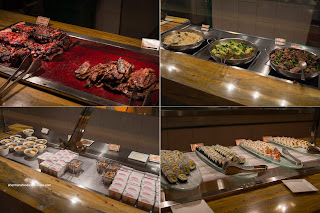 A couple of items that I did like was the Korean Short Ribs and Compart Duroc Ribs. As for the Asian stir-fry options, they were completely forgettable. The Thai Basil Fried Rice was dry and flavourless while the Baby Bak Choy with Garlic was okay considering it had been sitting there. It was still crunchy. I absolutely hated the Broccolini with Beef. Nothing particularly wrong with the broccolini, but the beef was sliced thick and really chewy. Then there was the Ramen... That... was not ramen. That couldn't even be considered food. It was so salty, I swear they were trying to brine the noodles. And no, the sushi wasn't good, but at least they tried. As mentioned, The Wicked Spoon buffet is slightly different than the other buffets as it tries to serve up smaller dishes here and there. We tried all of them including the Angry Mac n' Cheese, Braised Beef with Polenta, Lamb Shoulder Cassoulet, Mushroom Risotto, Clams in White Wine, Calamari, Ravioli di Brodo and Fried Chicken Wings. The orecchiette was a bit soft (but to be expected), while there was a good amount of spice, yet the cheese tasted mostly of processed cheese food. We found the braised beef to be stringy and chewy, however, the polenta was quite nice with a nice rich flavour thanks to the red wine sauce. Our favourite was the Lamb Shoulder Cassoulet which featured moist, rich lamb atop nicely textured beans. We liked the pesto on top as it added a nice herbiness. Naturally, the risotto was a fail, but that was to be expected as it is a finicky dish, let alone sitting around in a buffet. It was mushy and wet with bits of crunchy onion which made it weird texturally. 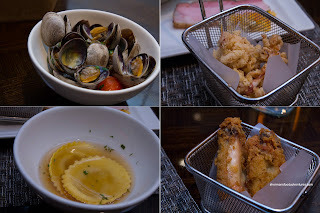 The clams were not bad with lots of garlic while the calamari was greasy and could've benefited from less breading. The ravioli was nicely al dente but the brodo was far too vinegary. The chicken wings were decent. 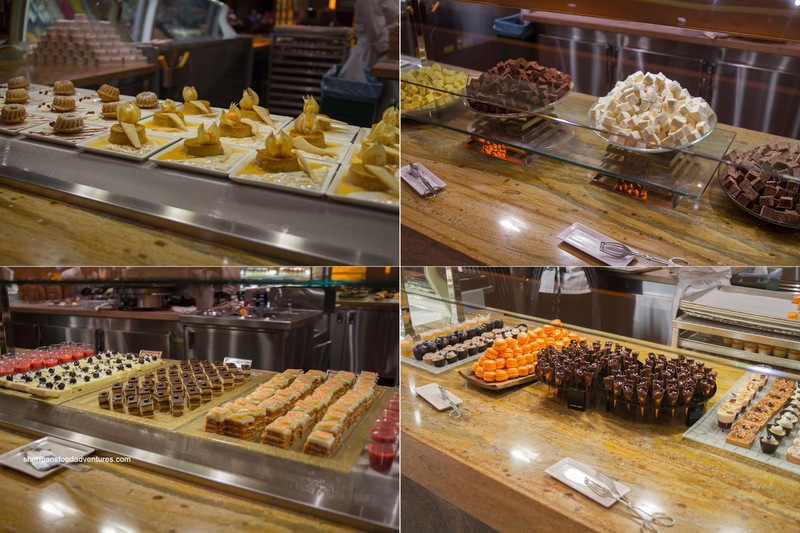 Now onto a section I'm sure is very popular with many people - Desserts! I didn't get to try all of them because there was an overwhelming array of cakes, fudge, pastries, ice cream and macarons. 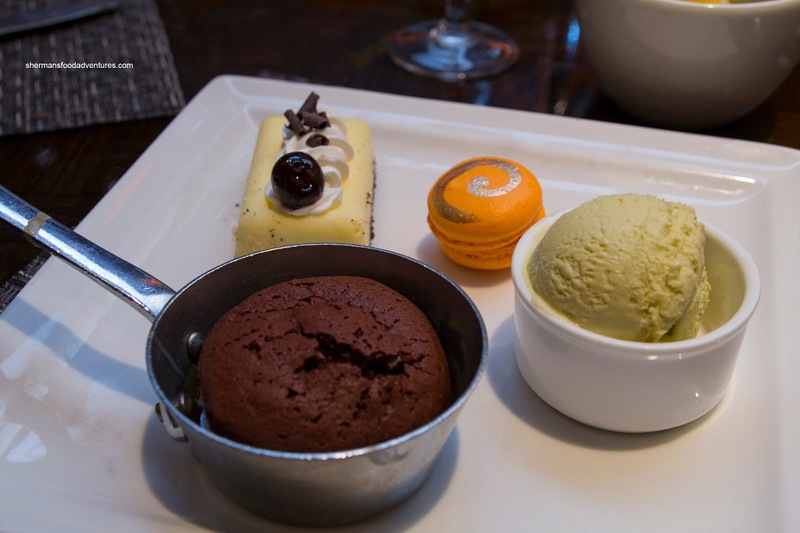 I ended up with a plate of Molten Chocolate Cake, Cheesecake, Macaron and Pistachio Ice Cream. I found the chocolate cake semi-sweet and lacking a bit in chocolate, yet the texture was nice with a crisp edge and moist interior. The cheesecake was pretty dense and not cheesy enough for me while the macaron was a bit chewy and too sweet. 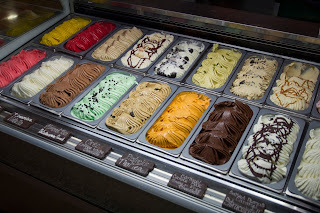 The ice cream was not bad being smooth and I could really get a pistachio hit. This was a decent finish to a relatively acceptable buffet. Of course it ain't the best way to experience food, yet it wasn't a total bust either. Naturally, some cuisines are best to be avoided and if you stick to the right items, the Wicked Spoon can be a good experience. Heading to Vegas, looking at your blog for inspiration. You should try the Buffet of Buffets deal next time. 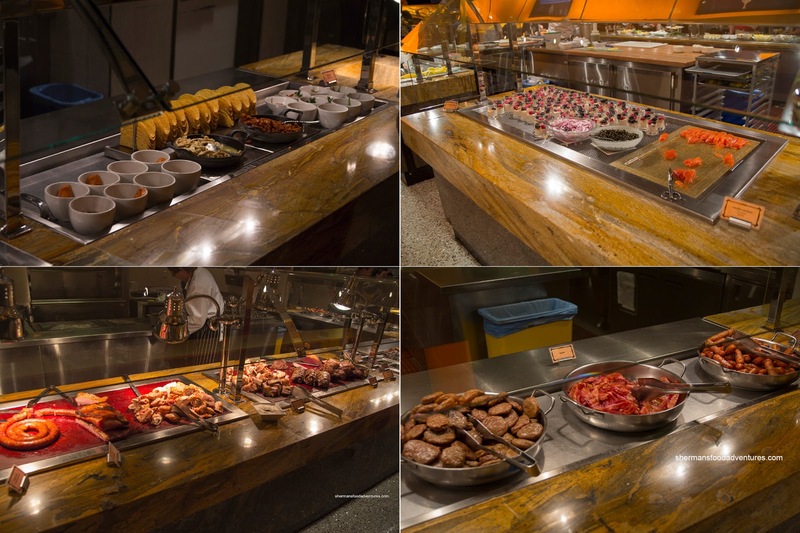 You get to to try any of 6 buffets just as long as it is long at it is done in a 24 hr time period. You can essentially fit in 4 meals, 2 dinners for about $49. Pretty good deal. For a little more you can also include Caesar Palace's $17 million Bacchanal Buffet. Can't wait for that.